Gender inequality in biodiversity conservation and management restricts women’s access to benefits at all levels, perpetuating poverty and undermining sustainable resource use and management. However, gender equality in this field is neither widely written into policy nor widely measured. In this study, the International Union for Conservation of Nature’s (IUCN) Global Gender Office (GGO) investigates reporting on women’s participation in the conservation and management of protected areas. 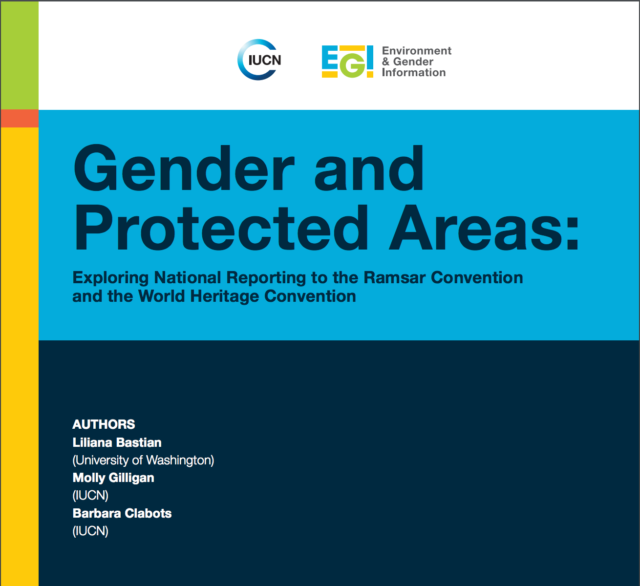 Using national reports to the Ramsar Convention and the World Heritage Convention, two widely ratified treaties that govern management of thousands of protected areas worldwide, this study defines the frequency, context, and tenor of discussions of gender and women’s participation in conservation. This study suggests that greater detail in reporting and establishment of mechanisms that measure cumulative progress toward equal participation of women could help improve our understanding of gender equality in protected areas conservation and management.